The San Francisco 49ers won QB Jimmy Garoppolo’s first start with the team, kicking a field goal late to put them up 15-14 over the Chicago Bears at Soldier Field. Garoppolo attempted 37 passes, completing 26 for 293 yards. He had no touchdowns and did have one interception, but it was not his fault. The 49ers didn’t find much room on the ground, averaging 3.2 yards per carry as a team. The Bears and QB Mitchell Trubisky played it conservatively, and he went 12-of-15 for 102 yards and a touchdown and had no turnovers on the day. RB Jordan Howard was stymied, rushing for only 38 yards on 13 carries. The story of the day was kicker Robbie Gould returning to Chicago, and all he did was go 5-for-5 on the day, including kicking the game winning field goal with just four seconds remaining. With that, we give you our PFF-exclusive takeaways from the contest for each team. 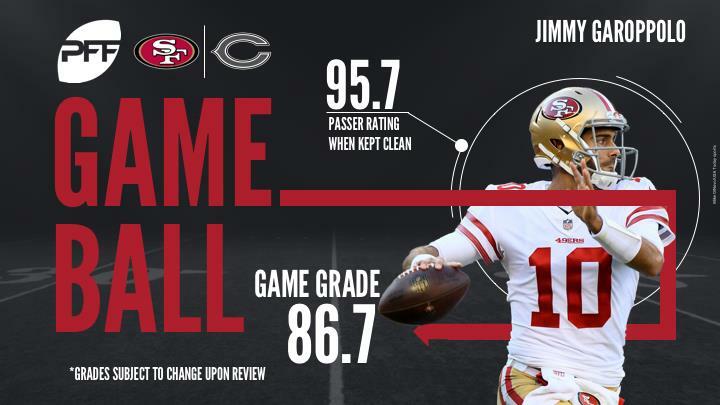 In his first start with the San Francisco 49ers, Jimmy Garoppolo put on a very good overall performance. Although the 49ers were unable to connect on any big plays down the field, Garoppolo engineered long sustained drives with his efficient passing. Other than his fumbled snap, he did not put the ball in any danger. His one interception came when the ball was ripped from Louis Murphy’s hands and was not Garoppolo’s fault. Garoppolo was at his best in a clean pocket, posting a 95.7 passer rating when he was not pressured. In Kyle Shanahan’s system of outside zone running, the center’s run blocking ability is absolutely vital to the team’s overall success. Kilgore was great at using his athleticism to seal off the Bears’ interior defenders to open up lanes for his running backs. In addition to the team’s highest run-blocking grade, Kilgore did not allow a pressure on the day and finished with an 85.3 pass-blocking grade. Buckner was held without a pressure for the first time this season. He had few opportunities (only 16 rushes), but wasn’t as typically disruptive as normal. Buckner also failed to register a stop, illustrating his lack of impact. After starting the season on a tear, Buckner’s performances have underwhelmed of late. Foster was less dominant than he has been in recent games, but he cleaned up plenty of inadequate work in front of him. He is so aggressive attacking the line of scrimmage, and his instincts are normally so sound he can trust his recognition to shoot gaps. Against the Bears, he tied for the team lead with four defensive stops, giving Michael Burton a torrid time when he came into the backfield to lead block for Chicago. Foster was as quick to attack against underneath throws, suggesting he can be an enforcer for San Francisco in the middle of their defense. Trubisky’s conservatism has limited his production early in his NFL career. He failed to attempt a single pass longer than 19 yards in the air, and threw only two passes beyond ten yards. Trubisky looked gun-shy on a couple of occasions in the pocket, inviting pressure through an inability to pull the trigger. As well as taking a couple of sacks, he also scrambled early on a couple third downs, allowing the 49ers to get off the field. Accounting for the two drops and throwaway, Trubisky ended up perfect on all 15 of his attempts. It was the throws he didn’t attempt, however, that represent a concern. Tired of having to face an All-Pro guard every year, the Bears made a concerted effort to get Josh Sitton into town. The former Packer can execute any block, whether in-line or on the move. He was lethal in space against San Francisco, especially in the screen game, and dominated with a handful of reach blocks on outside zone. The fourth-round draft pick from a decade ago shows no signs of slowing down. Kyle Fuller had the best game of all the Bears’ defenders against the 49ers. His highlight of the day was his interception that he took right out of Louis Murphy’s hands. Fuller also added in a pass defense, and allowed five receptions on 11 targets for 41 yards. The Bears’ secondary continued their great season with another solid performance by that unit. Amukamara was the second-best member against the 49ers on Sunday, allowing only three receptions on five targets for 27 yards in 40 snaps in coverage, good for a 79.7 coverage grade.